I have at least 12 of these batik colorwash kits to sell. It has 240 different batik 2.5" squares. It is $30 plus $6.45 priority envelope postage (which includes a tracking number and insurance). US customers only this time please. Email me at msfab14 (AT) yahoo (DOT) com if you want to purchase them. I will accept PayPal and personal checks for payment. 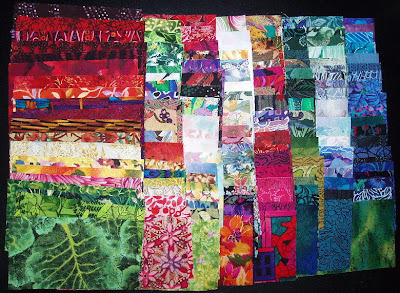 Here are 2 sample selections of one piece each of 120 different fabrics, regular quilting cotton (not batik). Pieces 2.5" x 4.5". There are 2 kits alike of one of the trays, the rest of the kits are a variation of the other tray (so all kits are not identical). The kits are intended as starter packages for a group from which you could assemble a colorwash quilt top. You would need to add additional fabrics from your own stash. I have 3 kits of 90 different African, Bali batik, and animal prints, 2 pc. of each, 180 pc. total. 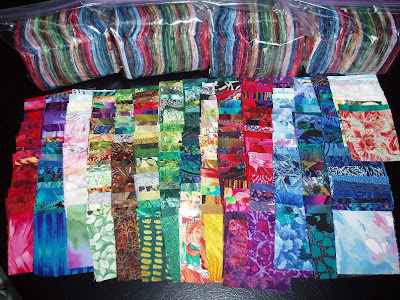 I have cut 41 strips of floral print fabrics, 2.5" wide. I have cut with a straight rotary cutter, not with the pinking blade that the jelly rolls use. I have 2 different kits available, 41 different fabrics in each kit. My price is $26 plus shipping (in comparison: A jelly roll is 40 fabrics and jelly rolls are $30-35) All of the fabrics in my kits are discontinued, no longer available prints. I did cut the selvage with words off before I cut the strips so they average 43.5" wide. Group # 1 has cream color backgrounds in the lightest prints. All sold, sorry 2/16/09.